The use of soured beer is an ancient technique used to add character to many beer styles. 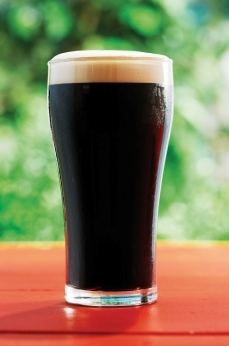 One of my personal favorites, the Irish Stout, often includes a small addition of soured wort. Sour beer dates back to the ancient times, as the discovery of beer likely occurred when someone left some wet grains out and they started fermenting. It has also been widely used in Belgian beers, where in many cases entire batches are left to sour in open vats, producing many sour styles such as Lambic and Flanders. Flanders brown is often made with blended sour and unsoured beer. I won’t cover Lambics in great detail here, as the methods used for Lambics vary considerably, but also often include blending soured wort with unsoured beer. Brewing with sour beer at home involves taking a portion of the wort from your mash (or for extract brewers, a portion from the boil) and setting it aside and either adding souring yeasts such as Lactobacillus or letting it sour naturally. Personally I recommend getting some Lactobacillus culture such as Wyeast Labs #4335 “Lactobacillus Delbrueckii” as natural yeasts and bacteria can often go awry. For Lambics, Wyeast #3112 “Brettanomyces Bruxellensis” or Brewtek’s “Brettanomyces Lambicus” are often used with other yeasts as part of the main fermentation or part of the fermentation. The spoiled wort is then pasteurized by heating it and added back into the original beer to give a slightly sour character to the beer. This will add character and a lactic sourness to the beer, which is desirable for many styles. If you are brewing an all grain batch, a portion of the runnings from your mash tun should be collected and set aside in a separate container. For something like an Irish Stout, I typically would set aside 1/2 quarts of wort from the middle runnings of the mash and set it aside for a 5 gallon batch. A good rule of thumb is that your spoiled wort should only make up about 3-4% of your total finished volume for stouts, and up to 25% of your volume for a Flanders Brown Ale, though I recommend starting with less and blending to taste. If you use too much you will end up with excessively sour beer. For extract brewers, you can draw a portion of the wort near the beginning of the boil, ideally after you add your extract but before adding the hops, as hops themselves can have an antibiotic effect. Once you have collected your wort, simply set it aside in a small closed container and continue to brew the remainder of your batch in the normal way. For the sour portion I prefer to simply add a small amount of Lactobacillus bacteria strain to the wort, apply an airlock, and let it sour in a cool, dark location. The soured wort will quickly get a sour smell, and likely a disgusting film over the top. After a few days it should be thoroughly infested and largely fermented. At this point, carefully siphon or skim and pour the liquid, attempting to leave as much of the scum and sediment behind as possible. Place the soured wort in a pan and heat it to 170F and hold it there for at least 30 minutes. This will pasteurize the soured wort to kill off the bacteria and yeast without destroying the sour lactic acid flavor you want in your beer. Rapidly cool the sour portion, being careful at this point to handle it with sanitized equipment. Siphon or very gently pour the soured wort into your already fermenting main batch, and continue fermenting, aging and bottling the beer as you normally would. Done properly, the sour mash method will produce a slight, but not overly pronounced sour edge to your beer. In styles such as classic Irish Stout, the sourness helps to enhance the overall flavor mix of stout roast barley and English hops. For Flanders, this provides the classic sour twang. This technique can also be used to sour some more sophisticated Belgian styles, though brewing a complex beast like a Lambic is beyond the scope of this particular article. I hope you enjoy adding a bit of sour twang to your next homebrew. Thanks again for joining us on the BeerSmith Home Brewing Blog. Consider subscribing for regular email delivery or drop a vote on our BrewPoll news site if you have enjoyed this article. Great article. You make it sound so easy. I use Beer Smith software for my homebrewing, is there a widget in the recipe software to support this? PS. any plans to support Mac os X? Isn’t it possible to take a portion of your mash, set it aside for a couple nights, do your main mash, run that off into the boil, then add the runoff from the soured mash? What would one consider “a small amount”? I’m planning on using a .75 gallon or so as my sour portion. Just wondering how much of the Lactobacillus I should add. A large smack pack or vial from White labs has about 100 billion cells. For 0.75 gal you need less than 25 billion cells (rough numbers) so you are looking at roughly 1/4 of a large smack pack/vial or you could just use a small smack pack which has about 20 billion cells. The above assumes the packs are relatively new and liquid yeast such as Wyeast or White labs. Awesome. Thanks a ton Brad. Great article!!! I’ve been playing around with doing a Gose as my first sour beer, after coming across this article I’m thinking this is the right method for what I want. Does one gallon out of a five gallon batch sound about right for the appropriate level of tartness? My biggest concern BTW is cleaning the souring container afterwards, am I going to need a dedicated vessel for souring, or can I use my dandelion wine fermenter (about 5 liters) without risking a souring of the wine next fall? While I myself. Am doing my first sour this weekend I don’t have all the answers. But the container you plan on using as your sour starter…should probably remain a sour starter. Though for a wine it might make for an interesting outcome…lacto is a tiny invasive beast and will hold on to the smallest pores in any container. Unless your using a super caustic cleaning solution. Not knowing the full extent of Lacto-resilience, would simple sanitation techniques be sufficient to avoid contaminating fermenting/brewing equipment? Do you always use a separate vessel solely for Sour-Beer? I believe you can safely clean/sanitize things like stainless steel. However plastic in particular (hoses, spoons, plastic vessels) are prone to contamination, so most brewers I know use separate plastic items as it is almost impossible to assure that the lacto bugs have not invaded your hoses or plastic vessels. I’ve heard you want to keep hops low if using Lactobacillus. If the Irish stout I’m brewing is 35 IBUs, is that going to be too much?